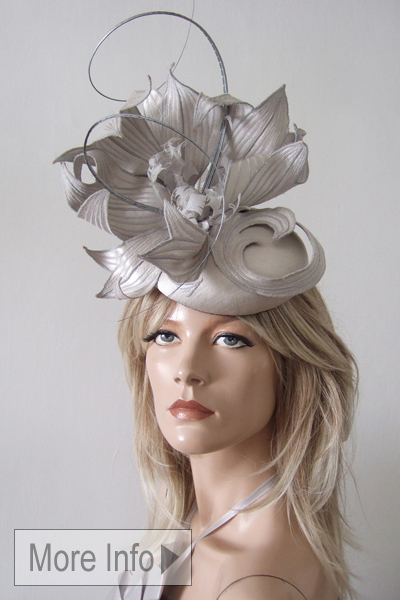 Modern Structural Headpiece from Contemporary Yorkshire Milliner Dawn Guibert, in Silver Silk Dupion, Dressed with Floral of Stiftened Wired Petals, Ostrich Quills and trimmed and Curled Goose feather centre. A pretty headpiece that really stands with the Large Silk Flower..
Headpiece Base Measures 6" x 6". Height including feathers arrangement measures approx 9". Attaches using an elastic that you wrap around the back of head, under hair, holding the headpiece secure to your front left of your head, and a supporting comb.